The story of how an obscure region of southern Europe became the gastronomic capital of the world encompasses many factors: political, economic, cultural, geographic, and even genetic factors have played a part. It’s a story that spans literally thousands of years – from the prehistoric settlers to Roman conquerors; from the volatile history of Spain from the middle ages all the way through the Spanish Civil War and the haphazard creation of the nation that we know today. In my travels to San Sebastian, I’ve come to realize that the story of the inimitable food culture here is best realized by understanding the people who live here – and have lived here for thousands of years – the Basques. And to understand the Basques, you must first start form the place where they live – the Basque Country – and its environment, geography and history. In the grand casino that is history – both human and geologic – there are few more propitious regions of the world than Spain’s Basque Country. It exists in the España Verde (Green Spain) area along the northern coast facing the Atlantic Ocean. 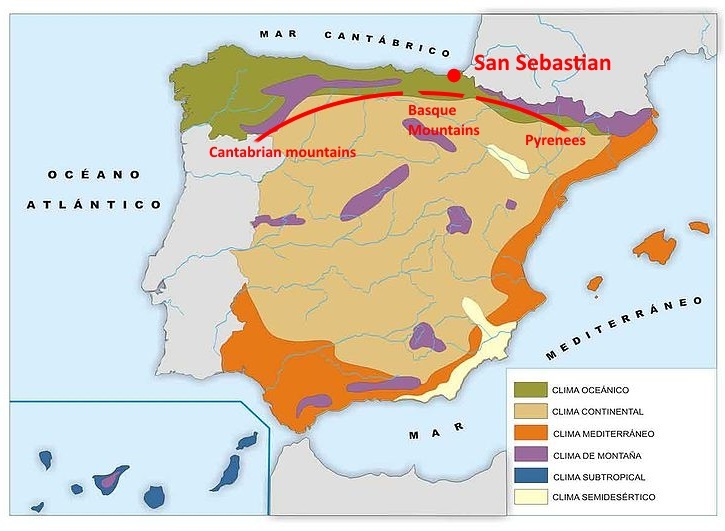 It is the place where, many epochs ago, the Iberian Peninsula began to grind up against the rest of Europe to create a majestic mountain range (the Pyrenees) and, eventually, a people and culture known as the Basques. These mountains – the Pyrenees to the east, the Cantabrian Mountains to the west, and the Basque mountains in between – act as a barrier for the moisture that flows south from the Cantabrian Sea, creating an oceanic climate and a verdant, fecund landscape closer to that of Ireland than to the dry, arid landscape of interior Spain. It’s in this fertile land of hills, valleys and coastlines that the earliest farmers began the tradition of cultivating and harvesting a wealth of natural resources – fruits, vegetables, herbs, spices – that would become the foundation for Basque cooking. Similarly, a long tradition of raising domestic animals and hunting wildlife, as well as an ancient tradition of Basque fisherman plying the Atlantic Ocean for fish and other seafood, further enhances a palette of ingredients that rivals any area of Europe. One of the oldest known crops to be harvested here is the apple. Many aspects of contemporary Basque culture derive from this ubiquitous fruit, starting with its fermentation in the form of cider. The first written references to cider-making go back to the 11th and 12th centuries, when farmers would harvest apples and bring them to the home of a prominent family to be pressed and stored in fermenting barrels. In this process, apples and cider-making became a communal tradition that still influences Basque culture, economy and even politics (more on that later). Cider houses (known as sidrerías in Spanish and sagardotegi in Basque) became the center of the Basque community starting around the 16th century. Apples would be harvested from September to mid-November, then pressed and added to barrels for two to six months of fermentation. Tasting during the “cider season” from January to May involved frequent communal gatherings to taste the cider as it aged, catch up on local news, listen to music and, most importantly for our purposes, prepare and cook food to be paired with the cider. Tradition holds that villagers were called to a cider tasting by drumming on instruments known as kirikoketas, made from wood formerly used for the cider presses, in a rhythm similar to that of the actual work of manually pressing the apples. Once convened, guests would stand around tall tables or sit at communal tables until called to the fermenting barrels where the farmer or innkeeper would open the tap and a stream of cider flows out to be caught by each guest in their own glass. A typical meal included a first course of cod omelet, a second course of beef, and a third course of cheese and quince paste. It‘s notable that this centuries-old tradition of cider (and later wine) being paired with food and experienced as a communal act still underpins much of the culinary tradition in San Sebastian and the Basque Country. Today, sidrerías and asadores (steakhouses) dot the hills and rural areas outside San Sebastian and still represent links to the Basques oldest culinary traditions. But it was only in the last century when European populations began migrating from rural to urban areas that Basque culinary traditions really started to get interesting.